Cobalt 27 Capital has secured the world’s first-ever streaming deal for cobalt, with a US$113-million payment to Australian company Highlands Pacific. Toronto-based Cobalt 27 Capital (TSXV:KBLT) has secured a cobalt streaming deal by buying the right to purchase 55 percent of Highlands Pacific’s (ASX:HIG) attributable share of cobalt production from the Ramu mine in Papua New Guinea. In a Tuesday (May 23) release, the company says that the arrangement is the first-ever streaming deal for battery metals. Streaming is a process that allows a company to make an upfront investment to secure future production at a lower price. Highlands Pacific owns 8.56 percent of Ramu in a joint venture with the Papua New Guinea government and Chinese company MCC Ramu Nico, which is itself 39 percent owned by other Chinese entities. Under the agreement between Cobalt 27 and Highlands Pacific, Highlands Pacific will increase its ownership of Ramu to 11.3 percent using the US$113-million payment from Cobalt 27. Cobalt 27 will be able to purchase 55 percent of Highlands Pacific’s 11.3-percent share of cobalt production from the mine, along with 27.5 percent of its nickel production. The company has also locked prices for the vital metals all the way to June 30, 2023. 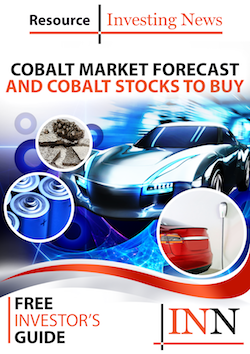 Its wholly owned subsidiary Electric Metals Streaming will make ongoing payments of US$4 per pound of payable cobalt — well below the current trading price of US$40 per pound. Additionally, Cobalt 27 has locked in payments of US$1 per pound of payable nickel over the same period. After that, the metals will be subject to annual inflation adjustments. Cobalt 27 Chairman Anthony Milewski said the transaction fulfils the company’s promise to deliver a cash-flowing cobalt steam from a world-class mine. “Ramu is a large world-class, high-margin and long-life asset which we view as the ideal candidate for our inaugural stream,” he said. “We believe the exposure to both cobalt and nickel, another key battery metal, will yield significant returns to our investors as electric vehicles begin to change our society in the coming years. Our partnership with Highlands will help Cobalt 27 continue to grow its position as the leader in battery metal streaming,” Milewski added. The Ramu mine has a projected lifespan of more than 30 years and was brought online in 2012 with production continually increasing since then. Cobalt 27 says the mine will have an estimated attributable stream production of 450,000 pounds (204.1 tonnes) of cobalt and 2.25 million pounds (1,020.6 tonnes) of nickel in concentrate per year. Highlands Pacific’s most recent quarterly report shows that the Ramu mine produced 8,210 tonnes of nickel and 774 tonnes of cobalt in Q1 2018. Cobalt is in the news plenty these days, with the majority of the world’s supply coming from the Democratic of Congo, which has long proven to be an unstable locale that throws challenges at miners that operate there. The metal, which is an integral part of lithium-ion batteries, acts as a thermal stabilizer and increases safety. Its value has been on the up on the back of growing demand for electric vehicles, and sourcing difficulties are now forcing some producers to look into new battery technologies. Cobalt was trading at US$41.73 per pound as of Tuesday (May 22), and has been trading on or over US$40 for the last month. At close of day Wednesday, Cobalt 27 was trading down 0.34 percent on the TSXV at C$11.86, while Highlands Pacific was trading on the ASX at AU$0.12 — up 29.03 percent.